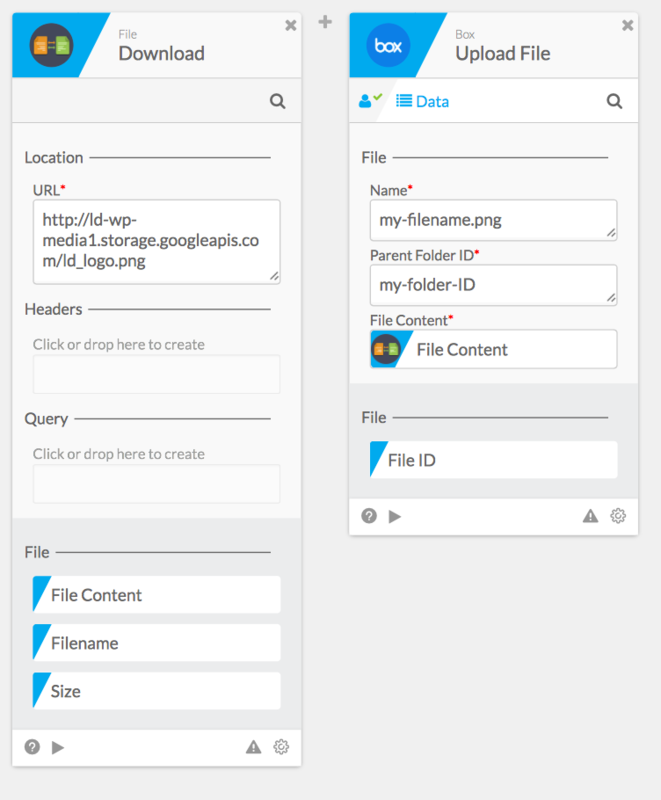 Downloads a file to the Designer file system over http or https. For example, any file that you can get to through a URL in your browser - like an image or a document file - you can download using this function. To use this function, enter the URL - including the http:// or https:// part - in the URL input. Optionally you can also use the Query section to build a query string, i.e. if you wanted to download a file from https://www.example.com/download?filename=foo.txt then you could express this in one of two ways. Either a) you could put that whole string into the URL input, or b) you could set URL to https://www.example.com/download and create an input filename in the Query section and enter a value of foo.txt. The latter method is easier when the value of filename comes from a previous step in the FLO - you can just drag the field into the input. You can also optionally set headers in the request. For example if the site requires authorization, you could add a header “Authorization: Bearer my-token” by adding an Authorization key to the Headers section and setting its value to Bearer my-token. Similarly you could set “Content-type: application/image” the same way. The primary output is File Content - this is the ID to use in subsequent cards. For example, if the next step of the FLO is to upload this file to Box, drag the File Content output of this card into the File input of the Box upload card. The file size limit for the download function is 1.5GB and is not specific to connected applications in the FLO.